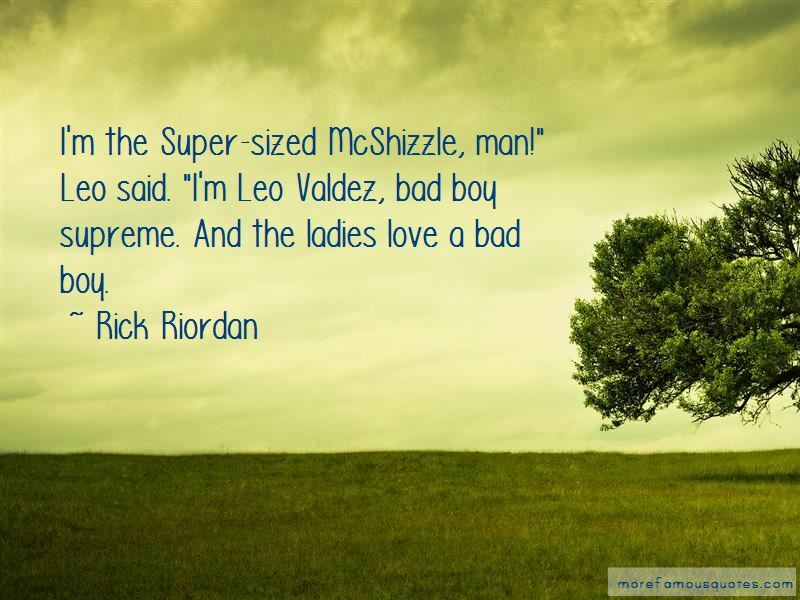 Enjoy reading and share 23 famous quotes about Leo Valdez with everyone. “Commander Tool Belt" Jason said. "Bad Boy Supreme" Piper said. "Chef Leo the Tofu Taco Expert." They laughed and told stories about Leo valdez, their best friend. They stayed on the roof until dawn rose, and Piper started to believe they could have a fresh start. It might even be possible to tell a new story in which Leo was still out there. “And the seventh hero ... Leo Valdez?" Nico raised his eyebrows. "You remember his name?" “Leo Valdez!" the spirit howled. "Open this gate or I will kill you!" “You cannot be in the presence of my father," the girl said. "Fire and ice-it would not be wise." "We're going together," Jason insisted, putting his hand on Leo's shoulder, "or not at all." keep Leo Valdez here. Guard him, but do not kill him." Cal pouted. "Just a little?" “Leo: "I can't believe I thought you were hot." “Leo lowered his screwdriver. He looked at the ceiling and shook his head like, What am I gonna do with this guy? "I try very hard to be annoying," Leo said. "Don't insult my ability to annoy. And how am I supposed to resent you if you go apologizing? I'm a lowly mechanic. You're like the prince of the sky, son of the Lord of the Universe. I'm supposed to resent you." Leo managed a little smile. "Yeah, see. I do annoy you." “Leo dropped into the pool and approched the cage. "Hola, Tia. Little bit of trouble?" “We've arrived," Leo announced. "Time to Split." “The eidolons started pounding on the door. “Hey." [Leo] squeezed her hand, though Hazel sensed nothing romantic in the gesture. "Machines are designed to work." "I figure the universe is basically like a machine. I don't know who made it, if it was the Fates, or the gods, or capital-G God, or whatever. But it chugs along the way it's supposed to most of the time. Sure, little pieces break and stuff goes haywire once in a while, but mostly ... things happen for a reason. Like you and me meeting." “You're alive!" Percy said to the others. "The giants said you were captured. What happened?" Leo shrugged. 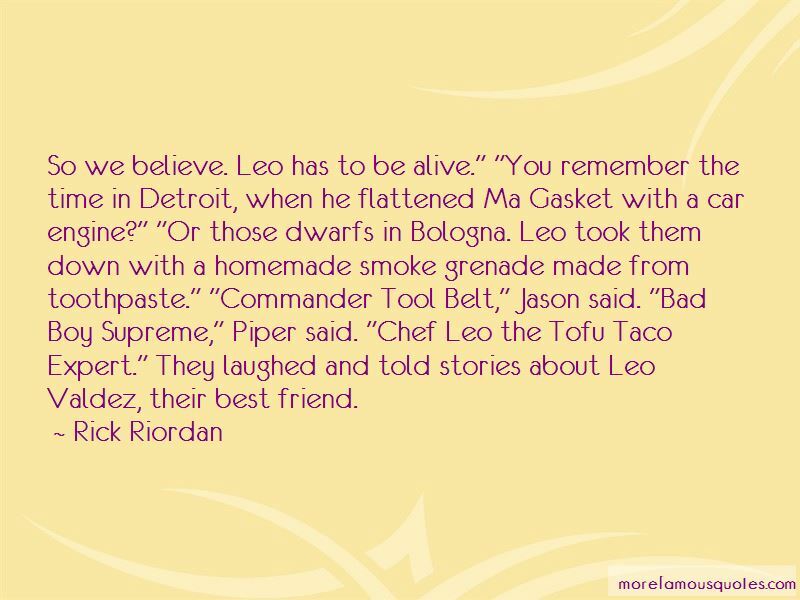 "Oh, just another brilliant plan by Leo Valdez. You'd be amazed what you can do with an Archimedes sphere, a girl who can sense stuff underground, and a weasel." “The raft finally got here," he said. Calypso snorted. Her eyes might have been red, but it was hard to tell in the moonlight. "You just noticed?" "But if it only shows up for guys you like-"
"Don't push your luck, Leo Valdez," she said. "I still hate you." "And you are not coming back here," she insisted. "So don't give me any empty promises." "How about a full promise?" he said. "Because I'm definitely-"
She grabbed his face and pulled him into a kiss, which effectively shut him up. For all his joking and flirting, Leo had never kissed a girl before. Well, sisterly pecks on the cheeck from Piper, but that didn't count. This was a real, full-contact kiss. If Leo had had gears and wires in his brain, they would've short-circuited. Calypso pushed him away. "That didn't happen." 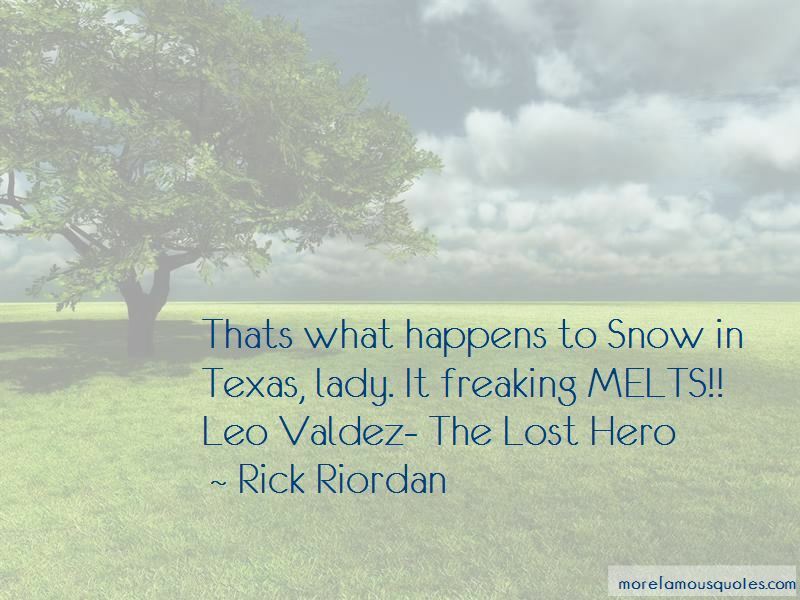 Want to see more pictures of Leo Valdez quotes? 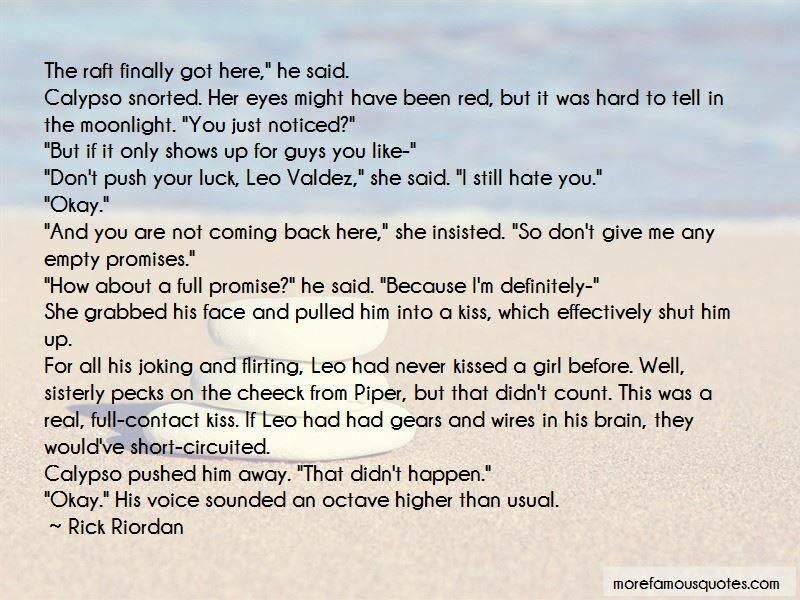 Click on image of Leo Valdez quotes to view full size.